Hudson Soft Co., Ltd. was founded in Tokyo, on May 18th, 1973. In 1975, they began selling PC-related products, and in 1978, they started developing video game packages. However, the publicly known game developing and producing history of Hudson began in 1983, when they switched their company policies and started developing proper video games for MSX, NEC computers and Nintendo's FamiCom system. From 1983 to 2011, Hudson's flagship was undoubtedly Bomberman, and the ship continues to sail under the command of Konami to this day and onwards. It has been speculated elsewhere, that the most likely inspiration for Bomberman was Namco's Warp & Warp from 1981, which is as close as you can really get to Bomberman before 1983. However, I would hazard a guess that the game Warp & Warp took its biggest influences was from Berzerk from Stern Technologies, and Wizard of Wor from Midway, both released in 1980. However, in Berzerk, only the top-down view in a similar aspect as you would later get in games like Boulder Dash and Dig Dug and such, was the common nominator, while in Wizard of Wor, the player was controlled in a similar manner in a size-constrained maze like in Warp & Warp. According to an article on Hudson Soft in the Next Generation magazine issue #3 (March 1995), the game was originally written as a technology demo for Hudson's BASIC compiler, and the original basic version was given a small release for Japanese PC's in 1983. 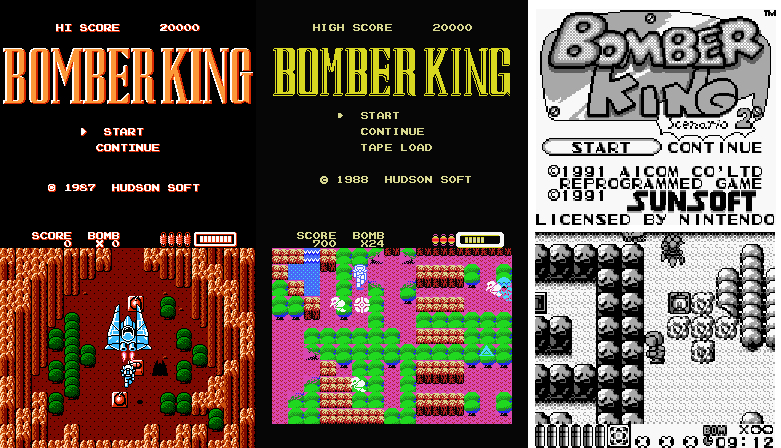 A few versions of the original Bomber Man, left to right: MSX, NEC PC-9801, ZX Spectrum. The concept of laying down bombs that explode in a cross-pattern to destroy your enemies and some obstacles was not entirely new at the time of conception, since the basic idea was clearly taken from the aforementioned Warp & Warp. Having this as the basis for the game instead of an additional gameplay feature was something worth exploring. Hudson Soft initially developed Bomber Man as a single-screen game of bombing action, and released it in July 1983 for the MSX, NEC PC-8801/6001, Sharp MZ-700 and FM-7 computers in Japan. A censored version was released in Europe as "Eric and the Floaters" for the MSX and Sinclair ZX Spectrum computers in 1984. The odd thing was, the only thing that was apparently needed to be censored was, that the enemies had faces in the original. Of course, we all know without saying, how well that worked. In any case, Bomberman wasn't quite fully developed in its first outing. The basic premise is just to kill all the floaters in the screen to get the bonus score and proceed to the next screen, but by blowing up destructible bricks, you could find treasure and an exit, through which you could escape to the next level without killing the floaters. However, by escaping through the exit, you would not get any bonus score. In later Bomberman games, the exit would be closed until you had killed all the floaters or other enemies, and instead of treasure, you would find power-ups of all sorts. The original Bomber Man (or Eric) has the ability to place as many bombs at a time as he wishes to, while in the latter Bomberman games, you start with a single bomb at a time. Although Shinichi Nakamoto originally developed the game for NEC and other Japanese home computers, he must not have been too happy with the product, because he supposedly went on to port the game to FamiCom in one marathon programming session that lasted 72 hours. While a fine gaming history legend indeed, this has not been confirmed by Hudson/Konami. Nakamoto has been known to comment on the game in a 1995 interview, that he personally believes that "the FamiCom version of Bomberman is the one and only version of the game." Be that as it may, it's still only the first major step to stardom, and rather oddly, this version is one of the rare ones to feature scrolling levels instead of single-screen areas. Naturally, since Bomberman was originally made for home computers, the new Nintendo version had to be ported to at least one of the original game's release platforms, and in 1986, the NES Bomberman was released on the MSX computers as Bomber Man Special, which in turn was a bit unsuccessfully pirate-converted for the Sega Master System around the same time. Oddly enough, the Bomberman phenomenon wouldn't (officially) reach North America until 1989. In Europe, we already had our Eric. It might just be my opinion, but the reason why the franchise works so well (to me) is due to its multiplayer options included later in the series and new ideas implemented ever so often in new installments in the series. Of course it helps, that the massive fanbase Bomberman has is still making it spread wider across various platforms it was never officially released on, and thus enables new fans to find the originals. Bomberman being as popular and well-known franchise as it is, it's easy to find a comprehensive list of the games in the official series, such as this one at Wikipedia, which even features spinoffs and some of the unofficial ports (clones), but not nearly every one of them. There's even a Wiki-site entirely dedicated to all things Bomberman, but it hasn't been updated in a while, and doesn't feature comprehensive information on all the official games, even. But anyway, since there are such good other sources available, I'm only going to list my absolute favourites in the official series and spinoffs. Between the 1983 Bomber Man for MSX, NEC, etc., and the 1985 Bomberman for the Nintendo FamiCom (NES), Hudson also took a wild attempt at making a 3-D Bomberman on the MSX computers in 1984, which must have taken its main influence from J.K. Greye's 3D Monster Maze from 1982, released on the Sinclair ZX81. Well, I guess it just had to be done at some point - too bad a 3D Bomberman wasn't attempted later on properly in first-person view. It features both a first-person view as the main screen, and a map screen as smaller, scrolling window, but it's a bit of a struggle keeping up with your location at any given time. However, purely for its uniqueness, 3D Bomberman should be mentioned in this article. NES original, MSX conversion and GameBoy-only sequel. 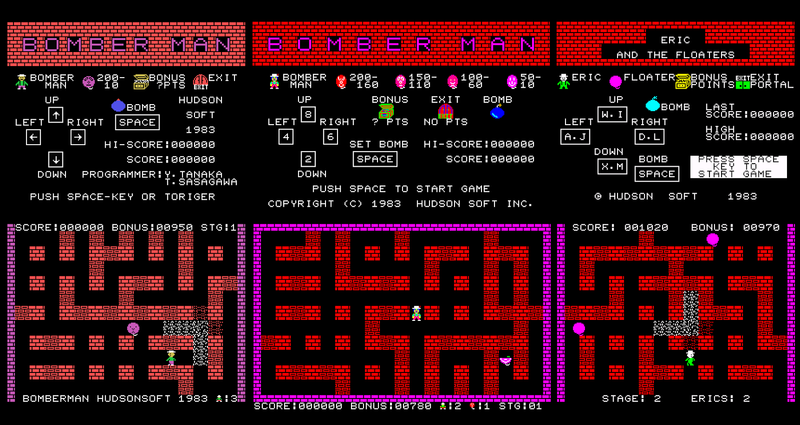 In 1987, Hudson Soft co-developed a spinoff of Bomberman with a company called Aicom, featuring some unmistakably Bomberman-like gameplay elements. Originally, the game was released in Japan as "Bomber King" in August 1987, but for the European and North American markets, it was released as "RoboWarrior". Oddly enough, the game was published by Jaleco. Even stranger, the original spinoff/sequel got a spinoff/sequel of its own: Aicom developed "Bomber King: Scenario 2" on their own for the Nintendo Game Boy in 1991, which got published by Sunsoft. Because that would have been simple enough, Sunsoft decided to market the game in European and North American territories as a game in the Blaster Master series - which didn't even resemble Bomberman all that much. Still, both games well worth a try. For a couple of years, Bomberman was keeping low profile. Hudson had been concentrating on working on their collaborative effort of a home console with NEC Home Electronics, which was known as either PC Engine in Japan and France, or the TurboGrafx-16 Entertainment SuperSystem elsewhere, so they had plenty on their table already. In North America, the system never really got the wanted attention, but in Japan, TG-16 was the main rival to Nintendo's Super FamiCom. Only after the console had somewhat established itself, Bomberman was ready to make an appearance on the TG-16 system. This new game was once again only called "Bomberman", which at this point, is beginning to feel a bit disorienting. 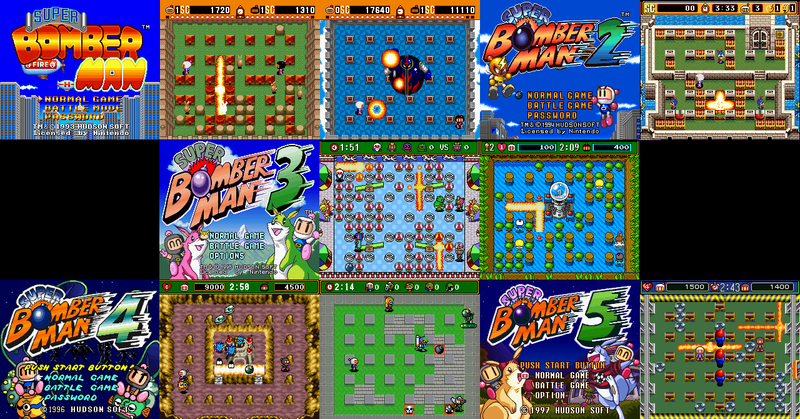 This update of Bomberman from 1990 was the first in the series to support five players. It was also the first game in the series to be released on IBM-PC compatibles, and the only game in the series to be released on Commodore Amiga and Atari ST. Apparently, it was also advertised to be released on the Commodore 64, but it never got finished - read more on the subject at GTW64. For us Europeans, though, the game was introduced as "Dynablaster", probably due to licensing difficulties or, if my instinct is right, just for convenience's sake. Interestingly enough, Dynablaster was the name Hudson used as the European title for their NES game Bomberman II the following year. The game was, while a fair upgrade of the first NES game, a slight downgrade from the TG-16 Bomberman. Having now some more modern multiplayer modes, Bomberman II utilises the NES Four Score add-on for a three-player match called Battle Mode. 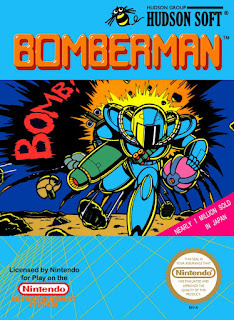 By this time, Bomberman had finally found its way into the arcades with the 1991 release, once again simply titled Bomber Man, which was also known in Western regions as not only Dyna Blaster, but also another alternative title, Atomic Punk. 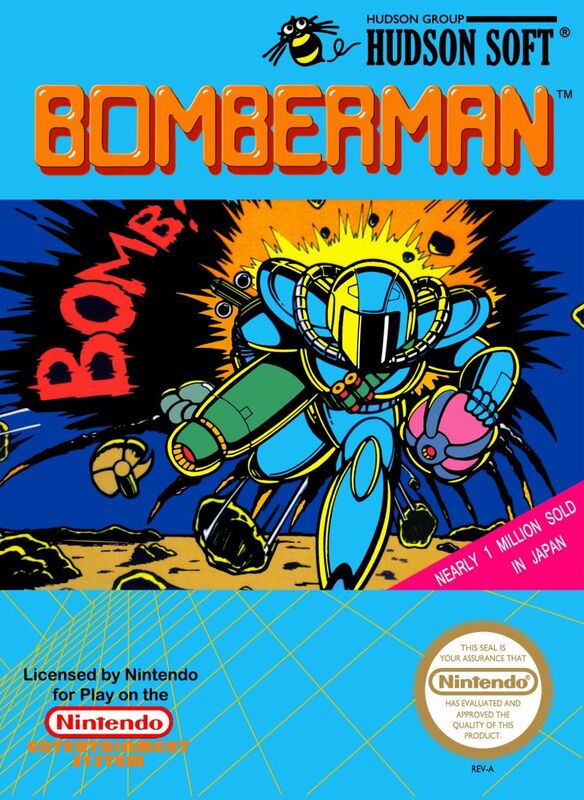 As if getting Bomberman into the North American market as Bomberman wasn't enough in 1989, they had to ruin the franchise when Bomber Boy for the Nintendo Game Boy was released in 1990, by giving that game the same oddball title, Atomic Punk. At least they remained consistent for the European market with Dynablaster. Of course, both the arcades and handhelds would feature many other Bomberman titles, but while the arcades kept on with the classic Bomberman form, the handhelds went a different route - which is more than I'm willing handle in this article. There's a lot of information on that subject in the Wikipedia pages I linked earlier. 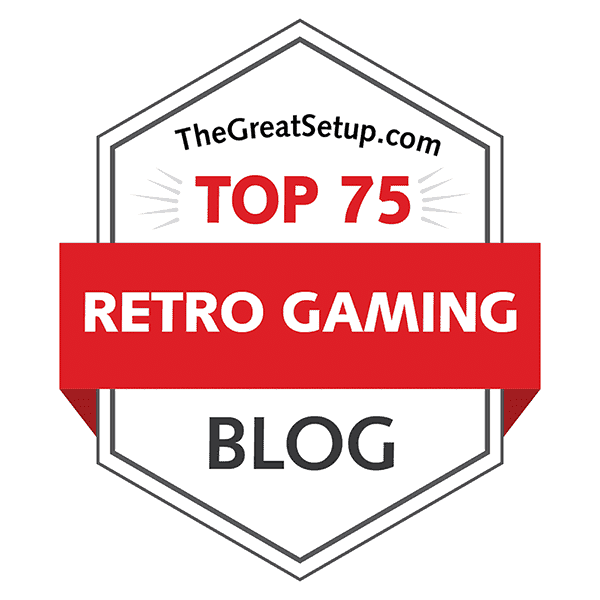 I have to admit, I was not a very big fan of Bomberman, nor was I all that keenly aware of its existence until I was introduced to the SNES-based Super Bomberman series by my occasional blogging partner SJ, way back in the beginning of emulation era. Even then, the first in the series was one we hardly ever touched, but rather kept exploring the levels and different multiplayer modes in all of the latter parts, now that all five games in the SNES series was questionably available. I'm also a bit sorry to admit, that of the entire Bomberman franchise, Super Bomberman 2 is the only one I have as an original in my collection, but that's mostly because SB5 was only ever released in Japan. What I didn't know until I began doing research for this entry, that the first Super Bomberman was also the first game in the series that was released with its proper name in both North America and Europe, instead of Dynablaster or whatever. 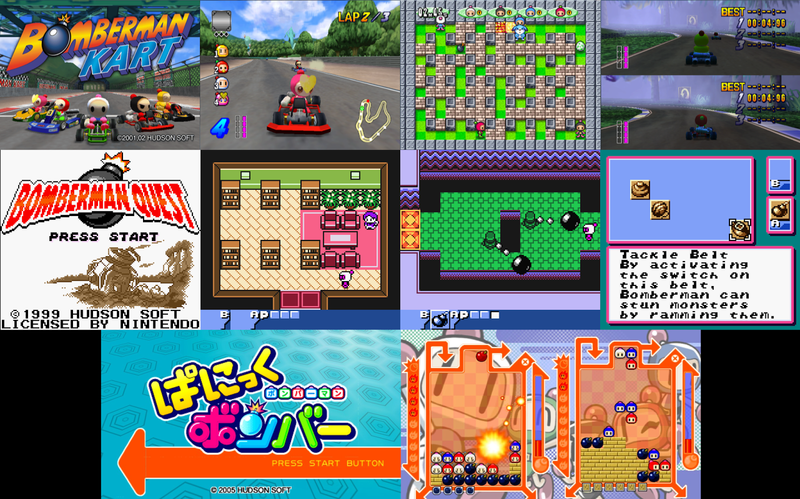 What I also didn't know is, that there was a sixth Bomberman game for the Super FamiCom: Bomberman B-Daman, a name which reveals an entire new franchise behind it, which I won't be getting into, since it's mostly a Japan-exclusive thing, and there are many good sources to read about it. The highpoints in the Super Bomberman series are the multiplayer arenas in SB2, the addition of mountable creatures in SB4, and the non-linear co-operative story mode in SB5, but each game has its own pros and cons that require some heavy exploration. Unfortunately, I'm one of those Bomberman gamers that only ever really focused on the multiplayer portion in the series, so I cannot really tell much of how the single-player modes differ from each other. It should be probably mentioned, though, that the first two Super Bomberman games could be played by four players simultaneously with the use of the Super Multitap, while the three latter games allowed a fifth player to join in the battles. During the same period, in 1994, a game called Bomberman '94 was released for the TurboGrafx-16, which not only became a source for various tunes in the Super Bomberman series, but it was also re-written for the Sega Megadrive/Genesis by Westone Co., and released as Mega Bomberman. This was the only official Bomberman game for the SMD, but Gamtec Corp. (apparently a Taiwanese company) made a nice single-player-only clone called Bomboy (a.k.a. Explosion Kid) in 1993. Both are different enough from the Super Nintendo games to warrant some investigating, but for more classic-style Bomberman action on the Genesis/Megadrive, Mega Bomberman is definitely your choice. The next huge step in development was making a Bomberman game with netplay support. This was first being developed in 1993, when a tech demo version for a customized NEC computer called Hi-Ten Bomberman was made, but never properly released. In case you're interested to check it out regardless of its unreleased state, click on this link to see pictures and video footage. Atari Corporation were planning on publishing an 8-player version for their Jaguar system in 1995, but due to the system's failure at selling, the game was cancelled after the developing team Genetic Fantasia having made a prototype. Finally, in 1996, while the Japanese Super Famicom users were still getting served with two more Super Bomberman games, Sega's new console Saturn got its own exclusive Bomberman game, developed by Hudson. This version became famous for being the first Bomberman with netplay support, and a possibility to play with 10 people with two multitaps. Not two weeks after the release of Saturn Bomberman, Interplay released their Atomic Bomberman for Windows PC's, which was the first of its kind - a Windows-exclusive Bomberman game. 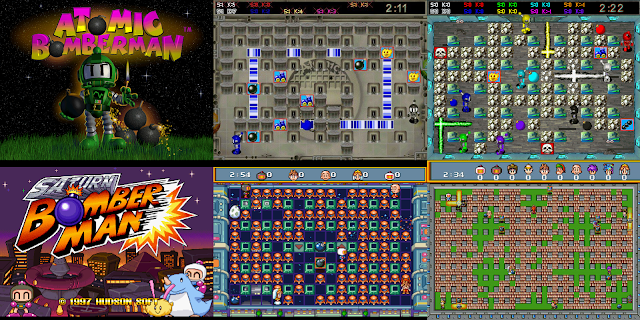 Atomic Bomberman also features netplay support for 10 players, but the game is most remembered by its pre-rendered 3D graphics, techno-inspired music and voice samples during gameplay. As it happens, Atomic Bomberman was developed by an American team, while most other games in the franchise were developed in Japan. As far as I know, this is the only official Windows-based Bomberman game. It's not bad, but it's perhaps too different from the rest. Worth a try, though. In 1997, the franchise reached the eventual point of having to go 3D like all the other Nintendo franchises did, when new games in any series were developed for the Nintendo 64. As you would expect, some changes needed to be made to suit the new 3D environment. Baku Bomberman (released as Bomberman 64 outside of Japan) featured an entirely new adventure mode, a freer-form movement style within three-dimensional maps, plenty of cutscenes and the bombs exploding in a very regular bomb-like spheroid fashion, instead of the usual cross-explosion that most other Bomberman games use. 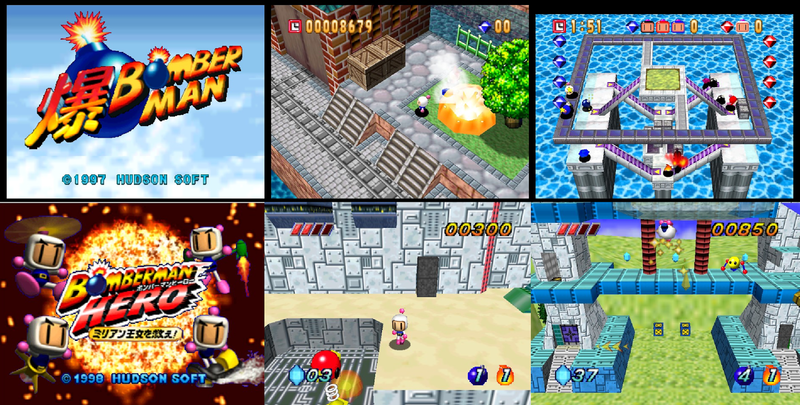 Bomberman went on to have three more adventures on the N64, one being a sequel to Baku Bomberman with nothing new worth noting apart from new bomb types, another being a platformer (Bomberman Hero) without a multiplayer mode, and a Japan-exclusive title, rather unimaginatively called Bomberman 64 - the only game of the four N64 titles not developed by Hudson Soft. Sony's newcomer console Playstation also got its own share of Bomberman games. 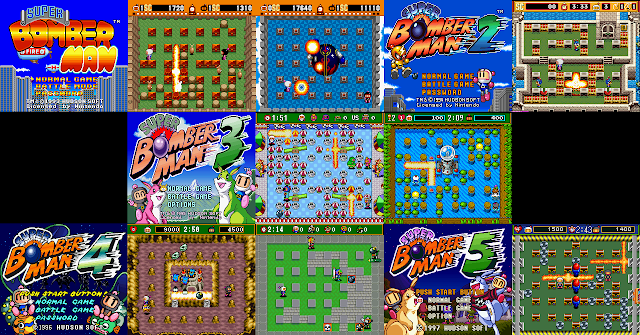 The first, Bomberman World, took the classic form of Bomberman games and turned the viewpoint more oblique, so that it would be almost isometric - similar to what we have seen in games like Blue Max, Realm of Impossibility and Fungus. This became a point of criticism for many, but it's not a bad game as such - it just needs getting used to. The voice acting is rather sub-par, though, as are the unnecessary cutscenes, but they needed to fill up the CD's with something, I gather. Bomberman Party Edition from 1998 (also released as Bomberman) still took the classic Bomberman style, and even featured a retro mode, which took most of its graphics and sounds from the NES version. 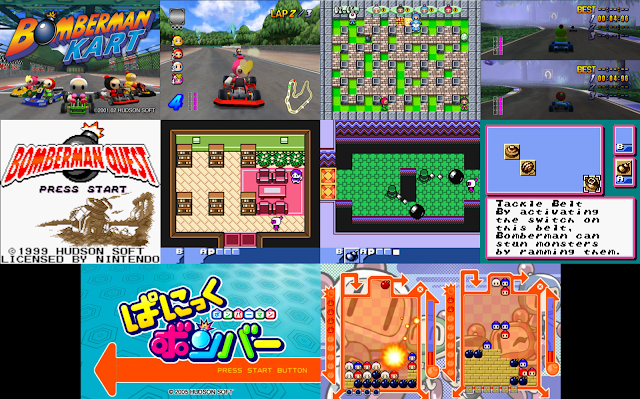 As the times were changing fast, and Bomberman as a franchise was getting too old and repetitive, Hudson decided to expand the Bomberman franchise into tons of different directions, such as strategy (Bomberman Wars, 1998, PSX/Saturn), role-playing games (Bomberman Quest, 1998, GBC), mini-game collections (Bomberman Land, 2000, PSX), puzzles (Panic Bomber, 1994, NeoGeo/PCE and 2005 remake for PSP) and kart racing (Bomberman Fantasy Race, 1998 and Bomberman Kart, 2001, PSX). Eventually, though, things would calm down and the Bomberman franchise would once again be more focused on the classic style. The last sort of old-school Bomberman game worth mentioning before Hudson went down and merged with Konami is not a particularly good game, but is worth a look simply because of what it is: a complete re-imagining of the basic game. In Bomberman: Act Zero (released for the XBox 360 in 2006), the whole game takes on a dark, dystopian sci-fi setting with oddly realistic graphics, and an industrial techno-rock and heavy soundtrack. I'm all for dystopian and dark, but it just doesn't fit the Bomberman franchise at all. Also, the adjustable camera makes the game a complete mess, much like all the 3rd person 3D-platformers have done from Tomb Raider to any other game to this day. Happily, while Act Zero was an interesting deviation from the norm, this idea was never repeated. The latest official Bomberman games are modeled after the classic Bomberman, or the Super Bomberman games to be more precise, and in my humble opinion, that's really the way it should be. Because most of us Europeans were blissfully ignorant of the whole Bomberman phenomenon after it actually took off as Bomberman, most of the 8-bit computers were left without an official conversion of either what became as "de facto" Bomberman on the NES and later consoles, or even a conversion of the original European port of the very first Bomber Man game, or Eric and the Floaters, as the Spectrum and MSX users would have known it here. After the release of Dynablaster on the Commodore Amiga, Atari ST and IBM-PC compatibles in 1990, the world of Bomberman was officially opened to us. But at that point, it was already too late for the 8-bits. Perhaps that is one of the main reasons, why there has been such a great amount of unofficial Bomberman-like games released for most of our favourite platforms since the mid-1990's. Oddly enough, an attempt at creating a clone of Eric and the Floaters for the C64 could be traced back to 1986, with Gerrit Knoef's "Blow It", published in the December issue of Input 64 magazine. While a valiant attempt in looks and sounds (featuring sampled speech! ), the gameplay suffers vastly from the enemies being able to go through your bombs. At least it has both a co-op mode and a competitive mode for two players. Perhaps even odder is, that before Mega Bomberman, there was no official Bomberman game for a Sega console, an issue which some pirates naturally managed to fix by converting the MSX version of Bomberman Special for the Sega Master System, albeit with awkward side effects for the soundtrack. Fast-forward 6 years. Practically the only Bomberman clone on the Amstrad CPC line of computers worth speaking of is a series by the name of Megablasters, originally written by Georg Odenthal a.k.a. Odiesoft, which was first previewed in 1992. 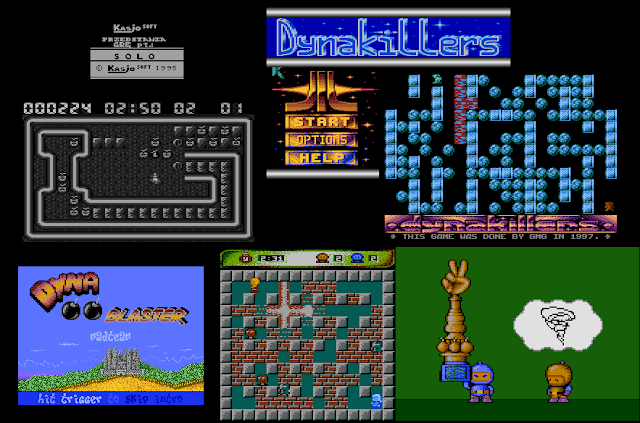 The first full version of Megablasters was published in 1994 by Radical Software, and it is still considered one of the highest landmarks of post-commercial CPC game developing. It features most of the power-ups from Super Bomberman, 9 worlds of adventure mode and a multiplayer battle mode with 4 players maximum. Megablasters was given a sequel of sorts by Paul Kooistra (also known for such Psytronik classics as Dead On Time, Relentless and Star Sabre) in 2015, with the subtitle "Escape From Castle In The Clouds", which is impressive in different ways than the 1994 game, but lacks in content, and is staggeringly difficult. Still, worth checking out. Aside from the Megablasters games, only a fairly simplistic Bomberman-clone called Retro Boom has been produced for the CPC in 2016. Now we need to go back to the C64, because the first truly notable Bomberman clone on the C64 was published in 1992 by a still commercially active German game publisher, Kingsoft. This game, Bugbomber, featured one of the last Chris Hülsbeck soundtracks for a C64 game, which is as good a reason to check the game out as any. However, Bugbomber was also released for DOS computers and the Amiga, which makes the game even more obscure a relic of the time. Also, Bugbomber differs from the classic Bomberman style by giving you multiple items to use in sequence, and giving each of the possible four players an energy meter instead of instant death. Before the official commercial demise of the C64, a German magazine called 64'er (published by Markt & Technik) published a 2-player-only Bomberman-clone called Bomb Squad on their Top Spiele #4 special cover-disk in 1993. Happily, it can safely be said, that it wasn't to be even nearly the end of Bomberman-cloning on the C64. A game preview by the name of Boombastic Benny was released in 1996. It was made by a group of Polish game developers, of whom only Michal "Skull" Okowicki remained to work on the game much later on. Skull found a musician for his otherwise upcoming solo effort in Owen Crowley, and no later than in 2007, Bomberman C64 was released at Game Over(view) Freestyle Jam, and brought new hope to the C64 users of finally getting a proper Bomberman game with perhaps a proper multiplayer support. 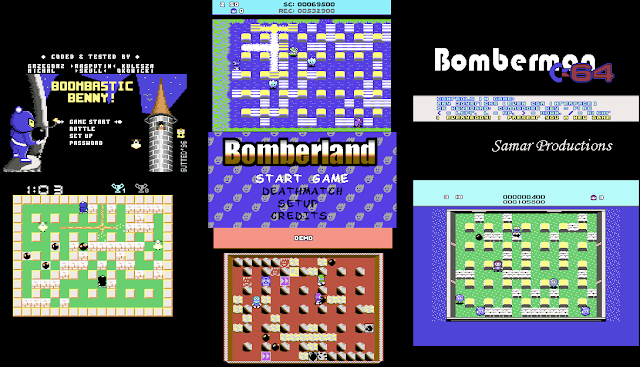 Work continued, and finally in 2013, Bomberland was finished with 4-player support (requiring the appropriate adapter, of course), and the game was published on cartridge only by RGCD. Well worth the wait, and I can not recommend it highly enough - I do have it in my collection, too. 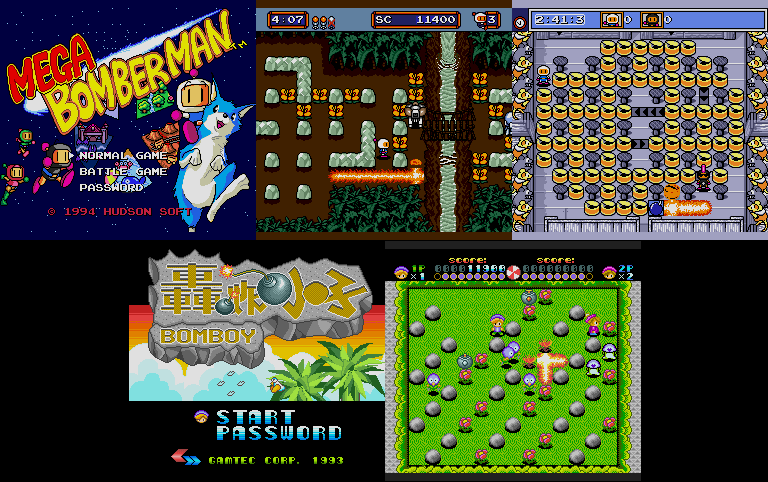 Other C64 ports perhaps worth mentioning are Protovision's Bomb Mania from 1997, which only has a multiplayer mode, but at least it also supports the 4-player adapter; and LK Avalon's similarly titled game from 1995, which only features a single-player mode, and the game couldn't look much further from a classic Bomberman style. In 1995, the MSX2 was blessed with its very own new Bomberman game from a third-party developer, Paragon Productions. Rather arrogantly reclaiming the official title to itself, the game by Paragon is closer to a puzzle game with an insane time limit and horrendous enemy AI, than a proper Bomberman game. They even made a sequel to it in 1997, featuring a battle mode (two players only), but I'm sorry to say, the single-player mode isn't much different from the previous version, and overall, I think Bomberman Special is still preferable on the MSX1. Although both games were published for purchasing at the time, they are both available now for free download, as is only appropriate. Even though the ZX Spectrum users had their own official Bomberman in the very first game in the franchise, Eric and the Floaters, it's perfectly understandable that having to settle for that particular game from the series must have been less than satisfactory, when other 8-bits were getting new Bomberman-clones. 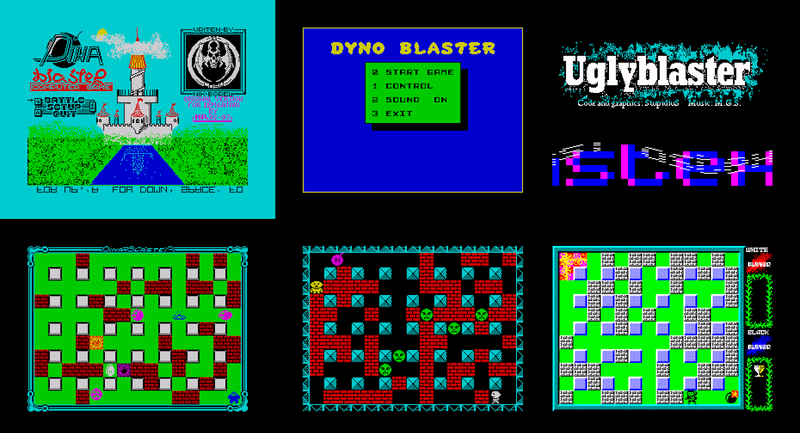 In 1995, the first new clone by the name of Dina Blaster was released by the Russian group Prestige for the 128k/TR-DOS Spectrum machines, and two years later, two more games bearing a similar title were released: Dyno Blaster for the 48k Spectrum by another Russian publisher called Computer Work Company, and Ugly Blaster for the 128k Spectrum by a Czech group StupidiuS. The former features only a single-player story mode, the latter only a two-player battle mode. Not until Tom Dalby's Bomberman-attempt called Flynn's Adventure in Bombland from 2011, did the Spectrum owners get anything resembling a proper modern Bomberman-clone. In fact, it's a rather good one, as it features a full story mode with a surprisingly good enemy AI and the usual upgrade items, as well as a neat two-player battle mode with options for selecting controls, the area (out of four available) and the number of wins needed. Aside from the needlessly long title, FAIBL is a good choice for playing a Bomberman game on the Spectrum. 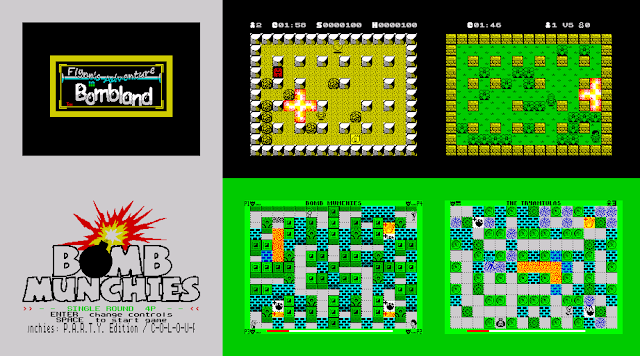 The latest entry in the series of third-party Bomberman games for the ZX Spectrum started being developed in 2013 - at least, that's what can be concluded from the World of Spectrum forum thread, of which the original post was done in January 2014, featuring the first preview release of Bomb Munchies by Matthew "MatGubbins" Carrier. Bomb Munchies is still being irregularly updated, and as of now, Bomb Munchies features a single-player story mode against "Tryantulas", a multi-player mode supporting up to four players (with the help from appropriate interfaces) and an interesting mode called Danger! UXB, a minefield-type of a game. Also, whereas Flynn's Adventure only features regular Spectrum beeper sounds, Bomb Munchies features a 128k AY-soundtrack from Yerzmyey, but the game is otherwise playable on a regular 48k Speccy. Even though Bomb Munchies is still in development, it's easily the most recommendable Bomberman-clone for the ZX Spectrum. I found three different Bomberman-likes for the 8-bit Atari computers from the Atarimania archive, although I'm rather convinced there must have been more attempts, if not finished products. The first of them, oddly descriptively called Solo was released in 1995 by Kasjo Soft as a preview/demo, but further development was dropped, which was just as well, because the first notable attempt was released by GMG in 1997 with the name Dynakillers. Still, it only features multi-player modes for 2 or 3 players and a number of similar stages with plenty of familiar power-ups, but it does feature a nice (if not very Bomberman-like) theme tune and sampled sound effects. The most unusual thing about Dynakillers, though, is that your movement is not strictly grid-based, even though you can only drop your bombs in a grid-like fashion. Finally, in 2004, MadTeam entered their version of Dyna Blaster into the ABBUC Programming Contest and won it. The game was made for a rather select audience - not that you couldn't play it on any emulator, but rather, the game requires 64kb RAM and two POKEY-chips for stereo sound to work on real hardware. The game feels like a proper Bomberman-game, and is great fun for two players, but once again, it can only be played by two players. MadTeam's Dyna Blaster does have two game modes called N and X, but I haven't figured out the difference. Whatever MadTeam's Dyna Blaster's shortcomings are, it is still easily the most faithful rendition of Bomberman for the 8-bit Ataris. Rewinding still back to the late 1990's, the independent game developing scene was just starting to thrive properly on PC's, and people were still making a good amount of games for the good old MS-DOS. Three rather well-known relatively straight Bomberman-clones popped up when doing research for this article: Nitro! from PLBM Games and Pyromania from Software 32, both released in 1997, and Mr. Boom from Remdy Software, released in 1999. Pyromania and Mr. Boom are both multiplayer-only games, of which Mr. Boom focuses on the possibility of using an IPX network, but two players can play on a single PC as well. Pyromania can be played by five players on the same PC. Nitro! is the only one of these three to feature a single-player campaign mode, but naturally, also includes a multiplayer mode, with five players maximum. As for their other qualities, Pyromania has the most interesting variety of bombs and other weapons, while Nitro! can boast of the most humoristic approach to the game overall - in both sounds and graphics. Mr. Boom takes a more traditional approach. Happily, none of them are bad in any particular way. The only Bomberman clone from recent times worth mentioning for the Sega Master System is a work-in-progress thing called BOoM! by ichigobankai and Vingazole, which they originally released for a SMS coding competition in 2014. Unfortunately, it only features a multiplayer mode, which requires a custom-built multitap, which apparently can even destroy Megadrive pads. Nice. But it controls and looks like any classic Bomberman game, so that's all good. Perhaps the sloppy pirate port of the MSX Bomber Man Special is still a viable option, after all - how about fixing that one with proper sounds and upgrading it with a two-player mode, eh? Now we get to the final two versions that I can actually test on my equipment. The first of them is Xplode Man for the Commodore Plus/4 by Assassins from 2014, which is strictly a single-player campaign game. The twists here are, that on death, you lose all your bonus items and cannot pick them up again, and a level is only completed when you have not only killed all the enemies from the screen, but also destroyed all the bricks. Also, of lesser importance, the levels are never exactly rectangular. As this version is rather difficult, it is nice to have level codes. The second is Ninjaforce Entertainment's KABOOM! for the Apple //GS from 2015, although its development seems to have started twenty (!!) years prior to that, if the game's credit sequence is to be relied upon as a source for information. It is claimed to be the only multiplayer game on the A2GS, which can be played by four players simultaneously, and I have no reason or evidence to claim otherwise. I haven't managed to get the campaign mode working yet, probably due to KEGS, but the other single-player mode is another time-attack mode, in which you need to destroy every destroyable thing in each screen. In multi-player mode, this might be a nice little things for the A2GS, but it looks as though it needs to be played by four players simultaneously. Still, much better than having no Bomberman game at all. without taking too much time finding out about it. I hope this article serves that purpose, at least. For the few Bomberman-clone veterans out there, though, if you feel like I've left out some of your favourites, you're welcome to add to the list by throwing a comment below. That's it for now, hope you enjoyed this little special! Special thanks to my occasional collaborator SJ for helping me out on some of these titles and screenshots, and thanks to all of you for continuing to read these blog posts. Next time, it's time for my last Finnish Independence Day special - let's just hope I can finish that one on time. Until then, pip-pip! Okay, thanks for the correction. Somehow I missed that bit.